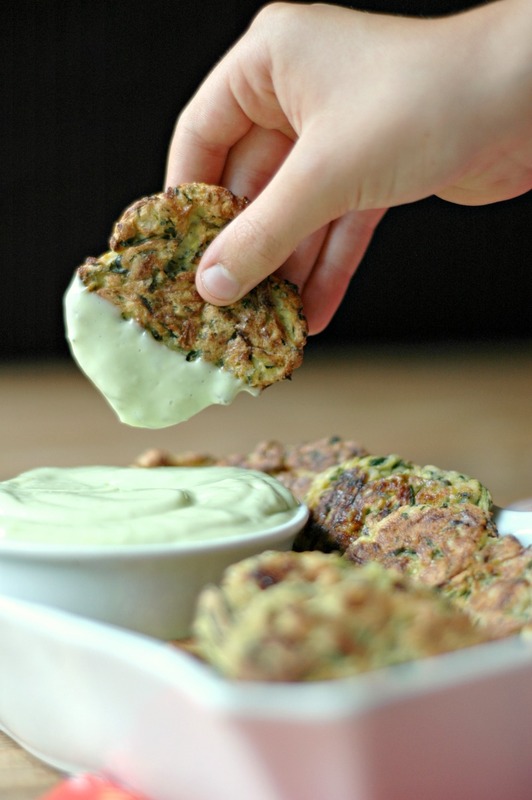 Thin & Crispy Oven Baked Paleo Zucchini Fritters PLUS, A Creamy Garlic Dipping Sauce! :: Gluten Free, Grain Free, Dairy Free, Nut Free! These oven baked crispy bites are about to less hands on time and the most amazing creamy garlic dipping sauce! I just never tire of it! It is my favorite summer vegetable to play with during this season, and zucchini fritters have been on my mind since June! It really just depends on what kind of a person you are! 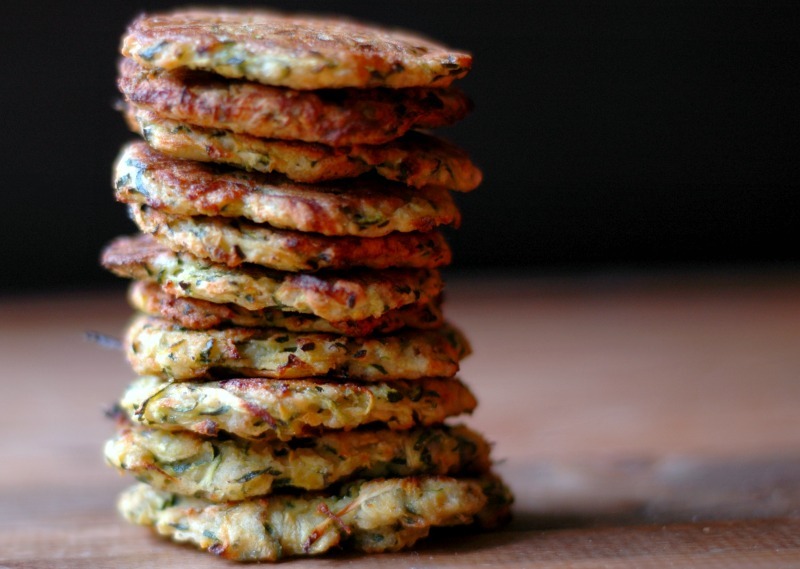 Do you like soft pillowy zucchini fritters? Then most fritter recipes you find will give you that crispy outside with a soft pillowy inside. I don’t mind those, but last year I accidentally squished my fritters in the pan super thin, and realized just how much I LOVE a thin, crispy zucchini fritter! It is serious heaven! But what about all that hands on time? I love a good pan seared zucchini fritter, but honestly I would probably make it twice a summer if I had to fuss with standing at the stove for 30 minutes for one side dish. You can only fit so many in one pan, and with my large crew to feed, well…it takes a while! I timed myself the last couple times I’ve made these oven-baked zucchini fritters, and from start to finish including making the batter, and flattening them onto a tray for the oven and it takes me 10-15 minutes (depending on kid interruptions!). From there, it’s as simple as popping the tray into the oven and then your hands are free to make the rest of dinner, or tend to kiddos. Thin and crispy secrets to success! There is definitely a method to the madness! Get the water out of the zucchini. 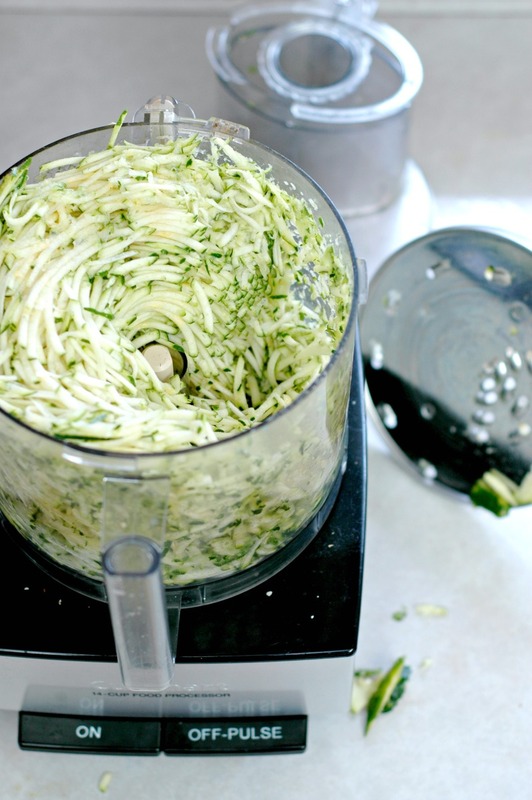 I know it seems like pain to drain the water from your zucchini before making your fritters, but this is really key. I like to speed the process up by adding the sea salt to the shredded zucchini. It draws the water out while I add the rest of the ingredients to the bowl, and you can squeeze that water right out. Skip the other water-logged veggies. While I’m all about extra veg in my food, adding onion and other veggies just adds more water to the mix. I use dried herbs and dried onion/garlic for these to avoid the extra water. Baking sheet surface matters. I love my Silpat liners, but I have just found that things crisp up better without them. From roasted veggies to these zucchini fritters, I tend to fore-go the Silpat or parchement paper. I use this avocado oil spray to spray the pan down (you can spread butter or coconut oil if don’t have that), and the zucchini fritters crisp up and slide right off. Squish ‘em down! The cassava flour and egg really help these fritters come together, so they aren’t super fragile. Form them into your hand, get them onto that greased baking sheet, and use your hand to lightly flatten them a bit more. I prefer whole plain coconut yogurt for the base. I get large 32oz tubs of plain So Delicious coconut yogurt at our grocery store. Full fat coconut milk or cream would work as the base as well as would raw milk/cream if you tolerate dairy. Sour cream or full fat dairy yogurt would work for the base if you tolerate dairy. Finally, tailor the garlic amount to your taste. I tend to boost the garlic on just about any recipe I come across, so my palate for garlic is pretty in love. If you prefer your food lighter on the garlic, I’d halve the amount. 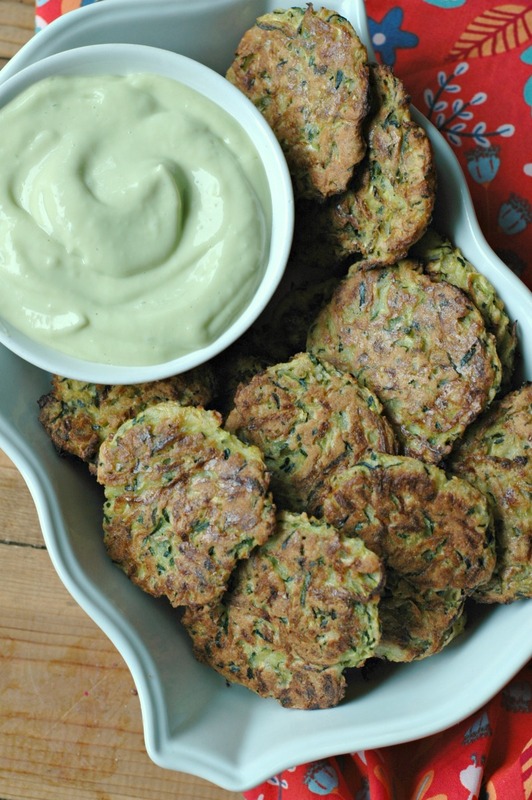 Thin and Crispy Paleo Zucchini Fritters PLUS, A Creamy Garlic Dipping Sauce! These oven-baked crispy bites have a most amazing creamy garlic dipping sauce! 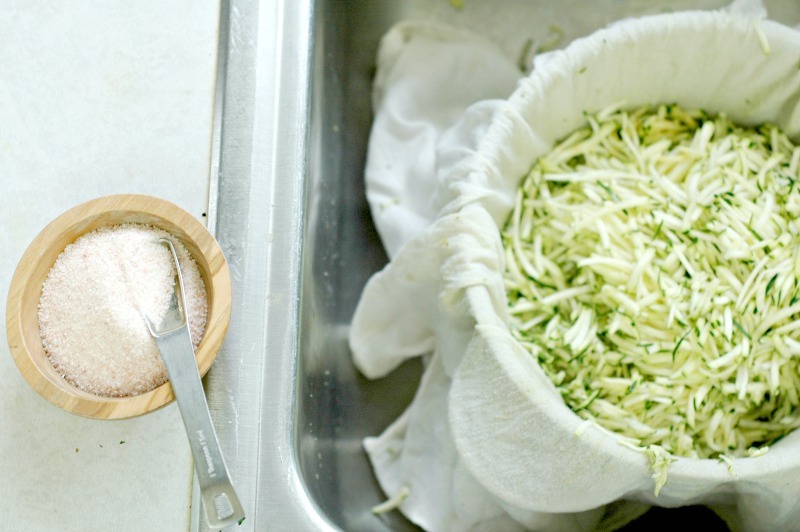 Place a thin kitchen towel over a colander, dump the grated zucchini in, and toss the zucchini with the sea salt. Let the zucchini/salt sit while you prepare the rest of the ingredients into a bowl. The sea salt draws all the water out of the zucchini, so you can squeeze it out easily. Put the eggs and seasonings into a medium mixing bowl and whisk together. 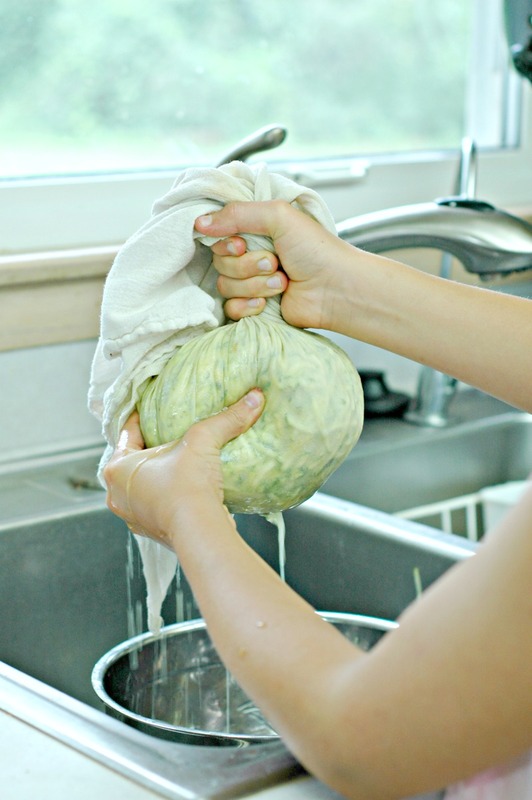 Pull up the sides of the kitchen towel that the zucchini is sitting in, twist, and squeeze out as much of the water from the shredded zucchini as you can. Put the grated and drained zucchini into the bowl with the egg/seasoning mixture, add the cassava flour, and mix together. Spray 2 baking sheets with avocado oil spray – this helps with sticking and also helps the fritters crisp and brown up. DO NOT line your baking sheet with parchment paper or with Silpat – the fritters will stick more with them (trust me) and they get much crispier on just the plain baking sheet. 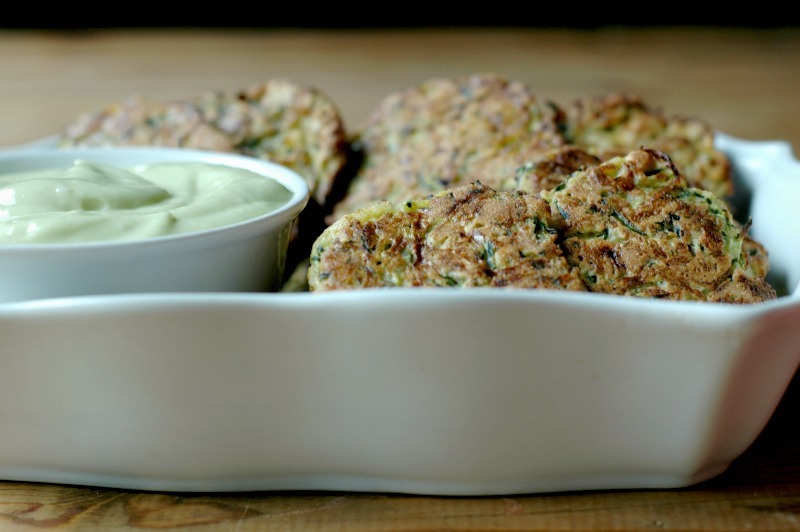 Make flat disks out of the zucchini batter, place them on the baking sheet, and then lightly flatten the disks on the tray using your hand a little more. Bake the fritters in the 425 degree oven for 10-15 minutes. 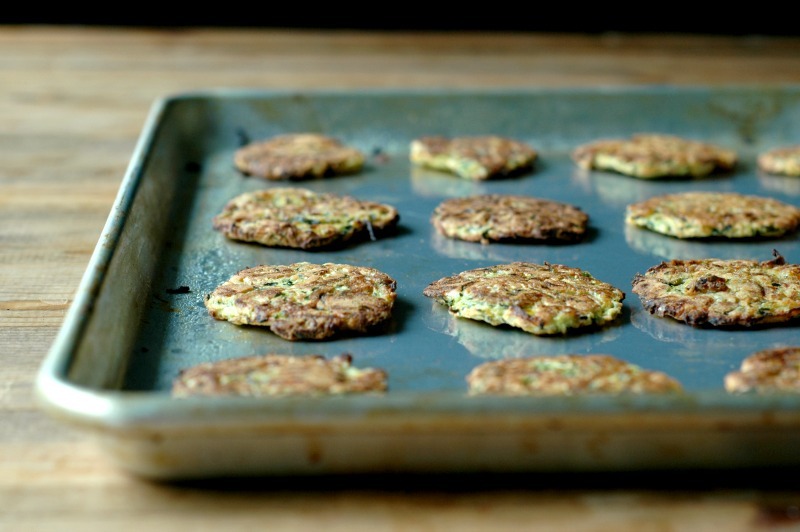 Take the tray out, flip the zucchini fritters over, and bake for another 10 minutes until crispy, golden brown. Let the fritters cool before handling. To make the dipping sauce, put all of the sauce ingredients into a pint mason jar, and blend with an immersion blender until smooth. 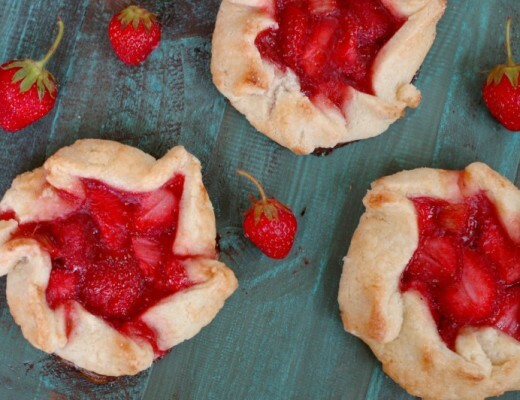 Strawberry Rhubarb Mini Galettes :: Simple Prep, Gluten Free, & Honey Sweetened! I cannot wait to make these!!! I LOVE the ingredients in these and have everything on hand. I know my Tiny Love is going to enjoy them too. There is a pile of zucchini in the fridge that would be perfect for this! Love the pics, love the ingredients!! I must make these! It’s zucchini time! These look beyond delicious and I love that you use the oven! Such a great snack! The sauce sounds amazing too. Love me some good fritters. Zucchini is my favorite, too; and I was worried about what you said (the prep time/frying) with such thin, beautiful fritters. Love your actual cooking time and tips, amazing! These are so appealing!! I’m adding these to our menu. The look delicious! Thanks for sharing! Those look so delicious! I love that they’re baked, not fried, too! 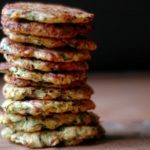 I love zucchini fritters but it usually takes me so long to saute them, so I am loving that yours can be done in the oven. This is such a great idea, I usually pan fry mine, but this looks so much easier! Plus thin and crispy is irresistible! They look SO GOOD especially they are baked. Simply amazing ! I have a bout 20 zucchini sitting on my counter right now- and this is a perfect way to use them! 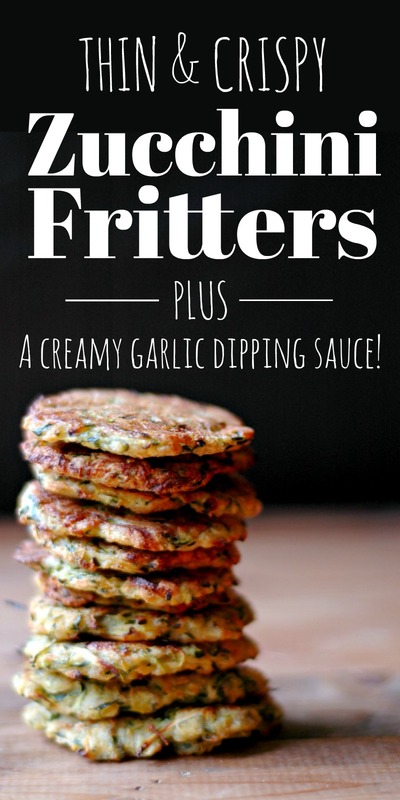 These fritters are perfect! With all the fresh summer zucchini – I need to make these! They look so crispy and flavorful, I can’t wait! FANTASTIC recipe and such great directions. My kids love these!! Hi Anna! I’m so glad the kids liked them! Now I know what to do with this pile of zucchinis from the garden. I love that you bake them in the oven. So easy! Perfect for zucchini season! I love snacks with a dip! That dip looks divine! YES. To all of this – the zucchini and the dipping sauce sounds amazing! 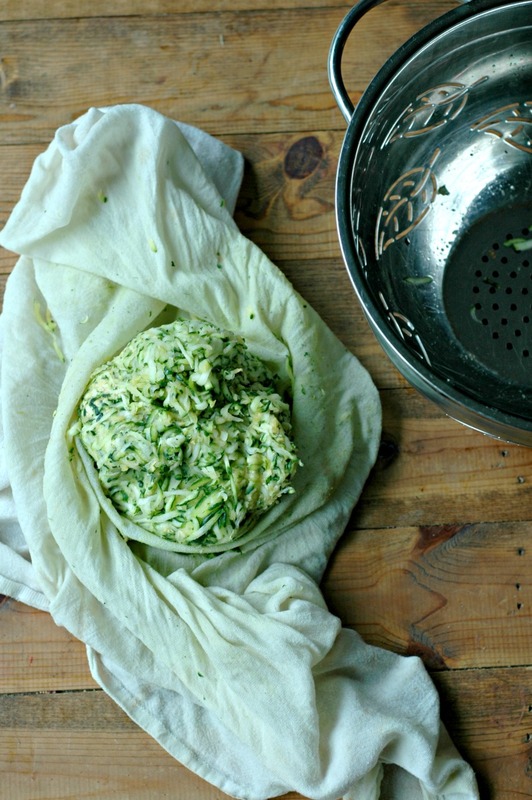 Zucchini is one of my favorite vegetables and love to cook it differently each time. This recipe is a keeper ! I love making zucchini fritters! Great tips, I also find using a Silpat makes food not as crispy as I’d hoped. SO excited to try these. I appreciate all the ‘secrets’ and great suggestions to make them crispy!!! We just harvested the first zucchini from our garden last week! EEEEEK! I can’t wait to make these! 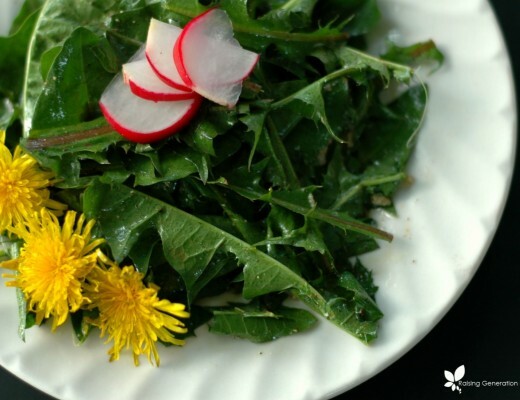 SUCH an easy way to sneak in some veggies – these look delish! I think this is one of the best things I’ve seen good wise on the Internet! Have to give these a try. I see these on my pancake griddle in the very near future…. thanks!! 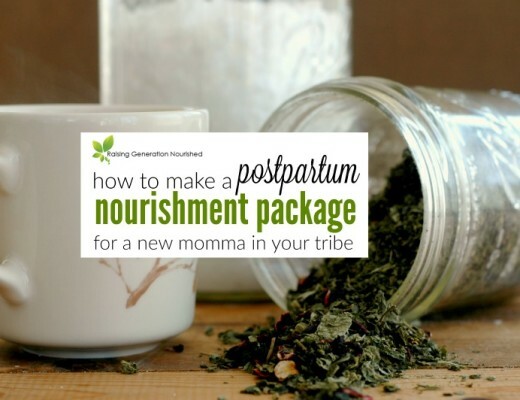 Do you have substitution suggestions for cassava flour (we also don’t do almond flour)? It’s not a staple in our pantry. Thanks! Hi Julie! I did freeze some to experiment and they worked well! Just crisp back up in the oven once thawed.